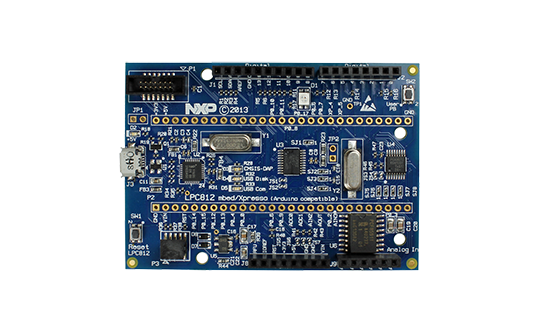 The LPC800 / LPC812 MAX Board (both names are used for this board - it is the same board) combines the features of the LPCXpresso, mbed, and Arduino environments. The board is designed in partnership with mbed and developed by Embedded Artists. This product is no longer sold in our webshop, but it is available with NXP’s part number OM13055 from distributors. Since the introduction of the first variant in 2009, the original LPCXpresso board has reenergised the whole MCU evaluation board market. Embedded Artists and NXP are now proud to introduce the new generation of LPCXpresso MAX boards which build upon the original design, providing many new and exciting features.